Eva Cockcroft's ceramic tile murals examine the Compton area's past, present, and future, with particular emphasis on the arrival of the various ethnic groups (African American, Latino and Samoan) that have contributed to the character of the city. 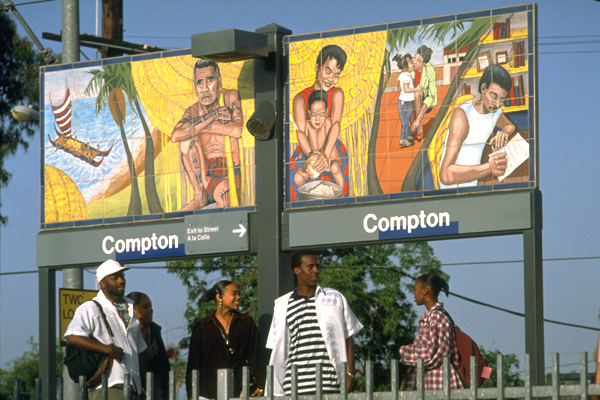 Twelve panels mounted above the platform benches examine the historical and contemporary life of the city, while two triangular tiled columns emphasize family life and are captioned with thoughts of today’s Compton residents and their hopes for the future. A painted mural at the station entrance, designed by Compton high school students and titled Universal Musicians, represents the musical traditions of each of the three major ethnic groups in Compton. Panel 1 presents the Indian, Spanish and Mestizo contribution. With a Mayan pyramid in the background, the Spanish soldier Juan Jose Dominguez leaves Mexico for California in 1769. In 1782 he is granted 75,000 acres south of Los Angeles, including the present site of Compton. A Mestiza woman and child stand in front of the Dominguez adobe. Panel 2 shows contemporary students/future leaders in front of Compton College. Panel 3 honors the contribution of the Samoan community--the largest such population in Los Angeles--to the life of the city. Panel 4 alludes to Compton's importance in the economic life of Southern California and features the Ambrose & Shepard General Store circa 1890, the common market of the 1920's and the site of Compton Mall today. Panel 5 The Children are Our Future, represents a grandmother with two children in front of the Catherine Street School; the companion panel shows a father playing with his daughter in their backyard. Panel 6 documents the first African American families who settled in Compton in the 1950's with images inspired by the great African American artist Jacob Lawrence. "The history books are filled with the stories of kings, generals and geniuses. My work celebrates the ordinary people ignored by the books, without whose convictions and courage no progress is possible." EVA COCKCROFT studied Art History at Rutgers University, and English at Cornell University in Ithaca, New York. She was an artist, writer, and muralist who worked on community oriented public art for two decades. Her murals grace the walls of cities like Los Angeles, Berlin, Long Beach, New York City, New Jersey, New York State and Nicaragua. She published two books and numerous essays in Art in America, Artforum, and the New Art Examiner. She taught at UC Irvine; her work is in several public collections including the Eli Broad Family Foundation the Museum of Modern Art in New York and the Wilfredo Lam Institute in Havana, Cuba. Up until her death in 1999, she lived and worked in Venice, CA.